It is that time of the year again when historians from across the country are preparing to gather together at the Canadian Historical Association’s annual meeting to talk about our work. The theme of meetings, being held in two weeks time, is “From Far and Wide: The Next 150.” As Canada enters the sesquicentennial’s summer season, hallway conversations will no doubt address subjects related to Confederation and its commemoration (or lack thereof, if the first half of the year is any indicator). Perhaps at top of mind will be CBC’s The Story of Us, a ten-part dramatization of the moments some of Canada’s best-known entertainers, politicians, business people and even a few historians wanted to celebrate with high production-value television. The series, as the tone of the previous sentence sought to instil, was widely critiqued by historians (see here, here, here, here, and here). Looking at this year’s program, however, suggests we may want to be careful in just how loudly we critique the television series. Some of the problems outlined about The Story of Us seem to apply equally to the CHA’s annual meeting. There are two widespread critiques of the television program that might also be applied to the content of this year’s annual meeting. First, The Story of Us was critiqued because it was a unilingual production with little attention to francophone perspectives, their history and culture. Second, the series takes a narrow view on the country’s early history, completely ignoring Indigenous histories before 1600, the importance of the sixteenth and seventeenth century fisheries, and the role of Mi’kmaq, Wabanaki, Innu and Acadian peoples in cultivating early (and foundational) relationships. Though my evidence is not derived from a rigorous study – mostly a few evenings spent with the conference program – an overview of this year’s conference suggests similar trends. Assuming that presentations with titles in French will be delivered in that language, of the 264 people presenting at the conference, only fifteen (6%) will be communicating to their audience in French. 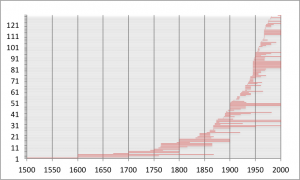 Similarly, of the 129 presentations that included date-specific information in their titles, only 26 (20%) deal with the period before Confederation; only 16 (12%) for the entire sixteenth, seventeenth and eighteenth centuries. These proportions are not all that different than those allocated by the TV series’ producers. These numbers are hardly surprising. Based on the five years that I’ve been taking a more in-depth peak at the program (click here for similar posts from 2013, 2014, 2015 and 2016 as well as more detailed discussion of my methodology), this year’s meeting in Toronto seems to be relatively typical. Last year, for example, there were 13 presentations in French and 23% of papers delivered on topics covering the period before Confederation. As others have identified elsewhere, there are a number of reasons for these disparities – particularly professional organizations where francophones and scholars of early Canada find a more comfortable home. If you are coming to the CHA for a comprehensive view of Canada’s past, though, you’re likely to be disappointed. If francophone presentations and early-Canadian history are not well represented in the titles of papers being delivered at the conference, what will participants be learning about? Much like in previous years, I’ve used paper titles as they appear in the preliminary program to generate a word cloud displaying the most common words used by conference participants. Some of the results are quite similar to previous years. 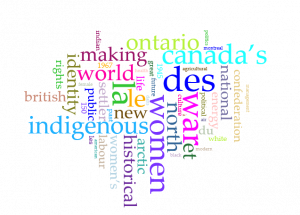 The words “war” (14), “Indigenous” (11) and “Ontario” (11) are some of the most frequently used. Other common high-ranking words such as “North,” (10) “world,” (10) “British” (8) and “national,” (8) also appear often. The most common dates are 1945 and 1967, which both appear six times; the word “Confederation” appears seven times. Importantly, since I began creating these CHA word clouds in 2013, the word “women” (12) has the greatest prominence in the program. It ranks second this year. Other new prominent words are “identity” (9), “Arctic” (8) and “settler” (8). The word cloud is, of course, only one way to look at the program. Once again, I tried to break the program down by region. This year, papers on transnational subjects (which includes the history of migration) rank the highest (62), nationally-focused papers rank second (55) followed by papers about Ontario (22), international subjects (18), Quebec (16), northern Canada (12), Atlantic Canada (10), the Prairies (9), and British Columbia (7). From a regional perspective, this year’s program is quite a bit different from last year’s meeting in Calgary where papers on the Prairies and British Columbia had much more prominence, while Quebec and the North ranked lowest. Over time, regional distribution of presentations tends to vary considerably, though Ontario-focused presentations seem to always rank high, partially reflecting its demographic and economic significance. This year, I added to the questions I asked of the program, creating a word cloud from presenters’ names and institutional affiliations. 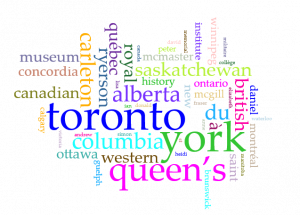 The word cloud above may partially explain Ontario’s regional dominance, at least for this year. What is clear from this image is that historians from the University of Toronto (32) and York University (29) dominate the program. If we set aside Queen’s University (20), then there are at least two additional presentations from these universities for every one from any other school in the country. Departmental size – especially the size of graduate programs – and location of the annual meeting certainly matter here. It would be interesting to see if similar trends apply to previous years. If so, this may explain why Ontario-focused presentations so consistently dominate regionally-focused papers delivered to the annual meeting. Last week on ActiveHistory.ca, Jim Clifford called our attention to the importance of climate history, noting that for such a significant topic the subject does not seem to be a major focus at this year’s meeting. Though I have avoided trying to categorize titles subjectively – favouring the word count instead – there are a few observations worth making. First, in terms of environmental history, in addition to a roundtable on the subject, there are about 15 papers that we might consider as actively engaging with the field; only one poster presentation (by George Colpitts) explicitly references climate change. This is in comparison to about 70 papers that reflect on the historians’ craft or teaching and nearly 40 papers on subjects related to Indigenous peoples (both pressing issues for the discipline). Anecdotally – I didn’t count – women’s, labour and diplomatic history seem to also be fairly well represented. Perhaps the most surprising absence from the CHA program is critical reflection on digital history. Only two paper titles use the word digital and only one session deliberately reflects on digital methods. Though many historians may be using these methods, and reflect upon their practice in their presentations, this is not at all clear from their titles. Given the profound shift in historical methodologies over the past two decades, this potential lack of critical engagement with digital methods is a significant problem and marks a contrast with the American Historical Association which has taken a much more focused and intentional approach to ensuring that these issues get discussed during its annual meetings. Canada has a number of leading scholars in this area and we should be asking why digital history doesn’t have a more prominent place at the annual meeting. In sum, if the CHA’s program presents us with an annual window into historical practice in Canada, then we can draw a number of tentative conclusions about the overall health of the profession (or at least the association itself). First and foremost, a number of subject areas such as Indigenous and women’s history, seem to be quite healthy. Others, such as early Canadian history (which has critical implications for understanding Indigenous histories) and digital history, appear to be far less vibrant fields. Importantly, both have strong international professional structures with which Canadian scholars no doubt engage; perhaps the CHA is not the right venue for these discussions. Absence of discussion on these subjects at the CHA, however, suggests that scholars who do not seek out these other forums are likely not part of the central discussions defining these fields. Similarly, the language barrier continues to divide historiographical discussion in Canada. Much like The Story of Us then, what we see in analyzing the CHA’s 2017 program is that, in this setting at least, there are substantive gaps in our discussions and understanding of Canada’s past. Based on this assessment of the CHA’s annual program, we might reflect upon the extent to which decisions made by the producers of The Story of Us share some similarity with contemporary historiographical practice in Canada. Are there lessons spinning out from these discussions that Canadian historians may want to heed as well? Thomas Peace is an assistant professor of Canadian History at Huron University College and an editor at ActiveHistory.ca. The 96th annual meeting of the Canadian Historical Association is being held at Ryerson University in Toronto May 29-31. Click here for more information. One thing you’ve not made a habit of tracking is the number of papers on non-Canadian history topics. This is a perennial concern for the CHA council. Should the CHA conference better reflect the AHA conference, where historians present on a much wider range of the history researched by historians working in the United States (and beyond)? More European or Asian history would leave less room for the diversity of Canadian history you’re calling for. An interesting article. I would like to agree with another poster that the issue of non-Canadian topics at the CHA is perennial. I was the Grad Student rep on the CHA council for 3 years in the 1990s. That issue came up each year, but no one seemed to have an answer. The general sentiment seemed to be that specialists in other fields simply presented elsewhere and the CHA didn’t come up on their radar. On the whole, concerns about papers and topics at the CHA have died down considerably in the last twenty or so years. I remember the problems that emerged at the 1994 CHA in Calgary. Some very unkind and biting comments were made about political historians at that conference. This was when people were still complaining about the dominance of social history and the decline of national histories(or at least complaining more than they seem to now). This led to a momentary schism and the emergence of a new history group (I can’t recall what it called itself, but I believe the words “National” and “History” were in the title). It held a conference in Ottawa about a year later but it didn’t last long past that. I think the problem the CHA will always face is it’s desire to be all things to all historians; however, when you try to be something to everyone you end up being very little to anyone.